The winner of last week’s Lunch Punch giveaway is Amy! If you are expecting high order multiples, this week’s review is for you! 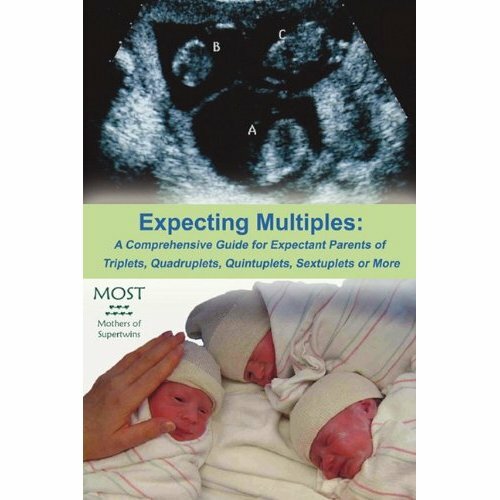 We received a copy of MOST’s Expecting Multiples: A Comprehensive Guide for Expectant Parents of Triplets, Quadruplets, Quintuplets, Sextuplets, or More to review and give away to one of our lucky readers. As a mom of triplets, I really wish this guide had been available during my pregnancy, as it is filled with information that every parent of high order multiples needs to know. I was a researcher during my pregnancy. I wanted to know everything that I might encounter so I scoured the internet for information, watched every episode of “Birth Day“, “Deliver Me“, “Special Delivery”, and of course read the infamous Dr. Luke book. Expecting Multiples, however, is a great resource due to it’s comprehensive nature; it covers the issues that come up from conception to birth, and is filled with facts that are based on real data from multiples families. It’s a literary one-stop-shop, if you will, of the information you need to know. As most of us are aware when pregnant with multiples, anything can, and very well may happen. The more educated that you are about the facts and possibilities, the better your chances are of making informed decisions, and feeling confident enough to advocate for the best care for yourself, and your babies. From the basic information such as technical terms, average gestational age for different types of multiples, and explanation of zygosity types, to the possible challenges we face during a HOM pregnancy, this book is definitely a great resource for every parent that is expecting multiples. I wish I could have also had some family members read it as well during my pregnancy! To win a copy, please check out the MOST website, which is a fabulous resource for parents of higher order multiples! Come back and leave a comment here, telling us one fact about multiples that you learned from their website. Good luck! And here’s another great giveaway for parents of infants, being held on one of our member’s blogs right now- check it out! Multiples and More QOTW: Are We Really More Likely to Get DIvorced? I loved the NICU timetable, it gave me a real goal to aim for with my triplets. I also "liked" MOST on FB. what a great giveaway! If i were to win I would find a Mommy who would enjoy reading this!! I learned I can approach potty training two different ways, whether it be both at once or individually. Will donate this to a local MoMs club if I win…great idea!